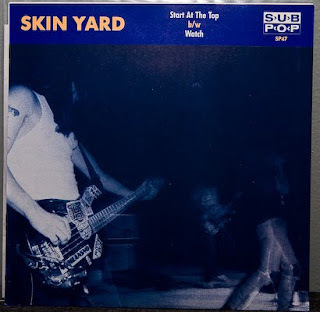 Ritual Room: Single: Sub Pop Edition #21 Skin Yard - "Start At The Top / Watch"
Single: Sub Pop Edition #21 Skin Yard - "Start At The Top / Watch"
For a blog that's named after a Skin Yard track and specializes in posting Sub Pop singles, some might say that it's kind of a failure on my part that I'm only posting this Skin Yard/Sub Pop single here now. Always better late than never, this is the fantastic "Start at the Top / Watch" single that was released in the late 80's and easily contains of my 2 favorite Skin Yard tracks. The first track is rippingly catchy and heavy with the strange vibes and rocking psychedelia that embody what I love so much about this band. The second track, "Watch", is eerier than the first but I promise you, just as raging. To summarize: this single will take you on a trip. Let it.